Hey friends! Recently I haven’t been posting much here because things have been C-R-A-Z-Y around our house. Bringing home an adopted 4 year old is no joke. Thankfully we’ve had friends bringing meals and praying for us! 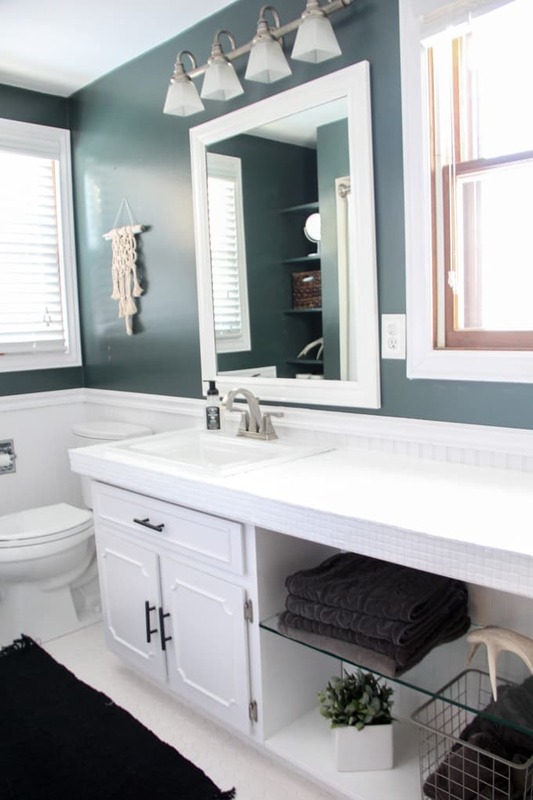 Before we headed to Haiti I squeezed in a few quick bathroom updates. In total these updates cost under $50! 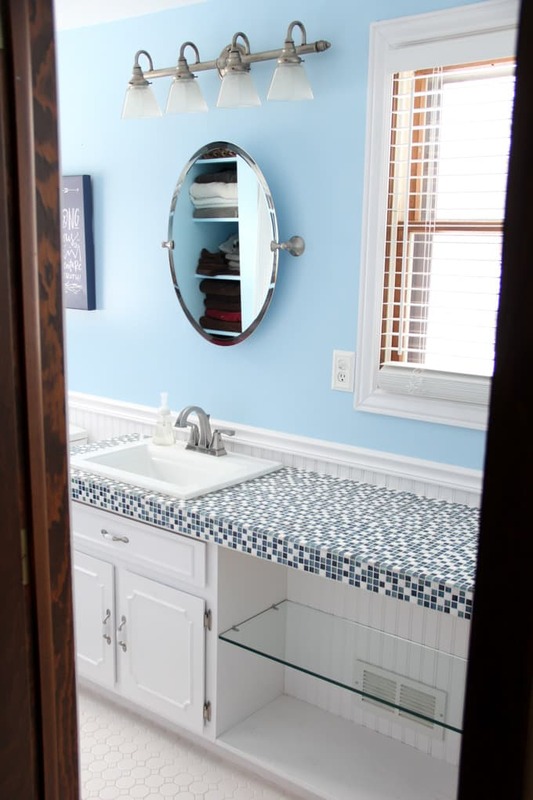 This bathroom started out as a baby blue bathroom with an undersized mirror, and blue tile countertops. Honestly it really wasn’t awful, but it also wasn’t really my style. The mirror was so small that the kids weren’t tall enough to see into it. When we moved in I found this wood mirror on clearance at Lowe’s for under $20. Even though it didn’t match I hung it up and lived with it. I also worked hard to get the white floor grout back to white again. 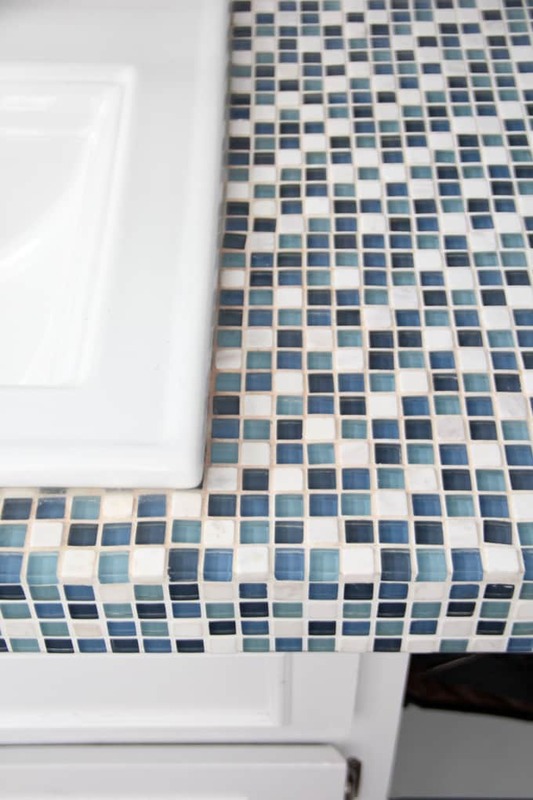 Although my method worked will on the floors, the grout on the countertops was permanently make-up stained, and the small mosaic tiles were too small to use the same method on. If you look close you’ll see the stains near the sink. 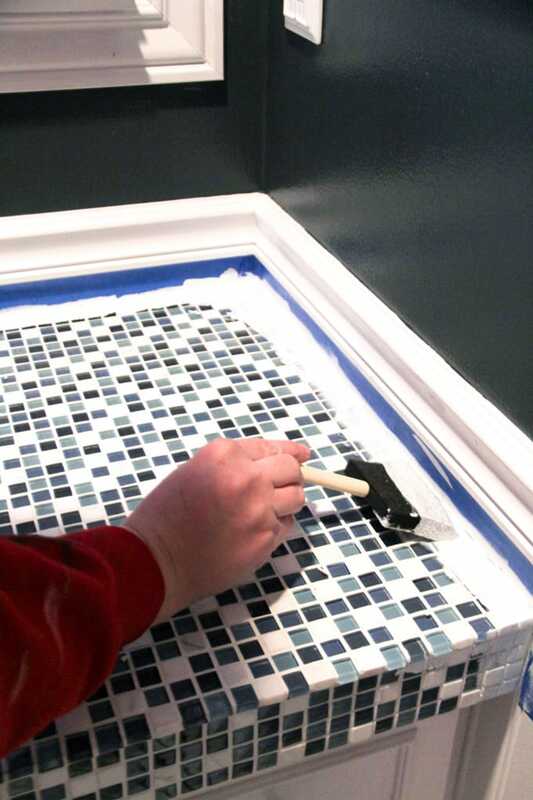 So today I want to share with you “how to paint tile countertops”. 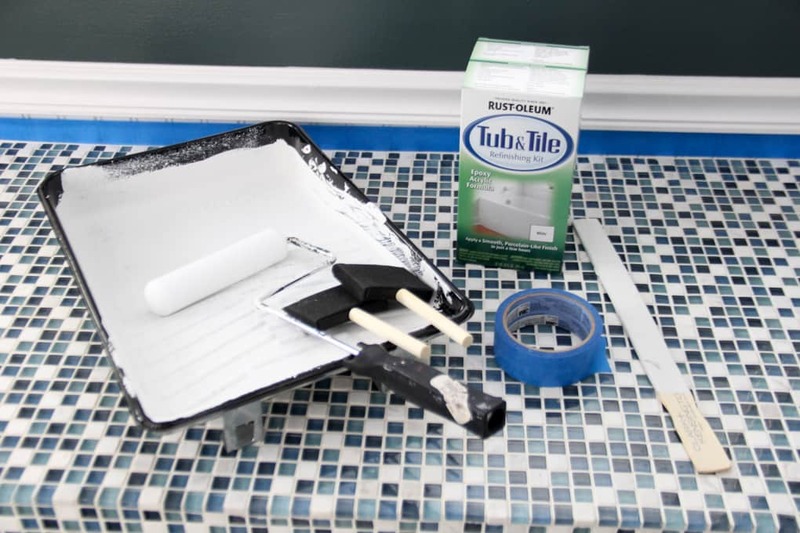 **contains affiliate links** I decided to use one of my all time favorite products, Rustoleum Tub and Tile Paint. I’ve used it tons of times before. 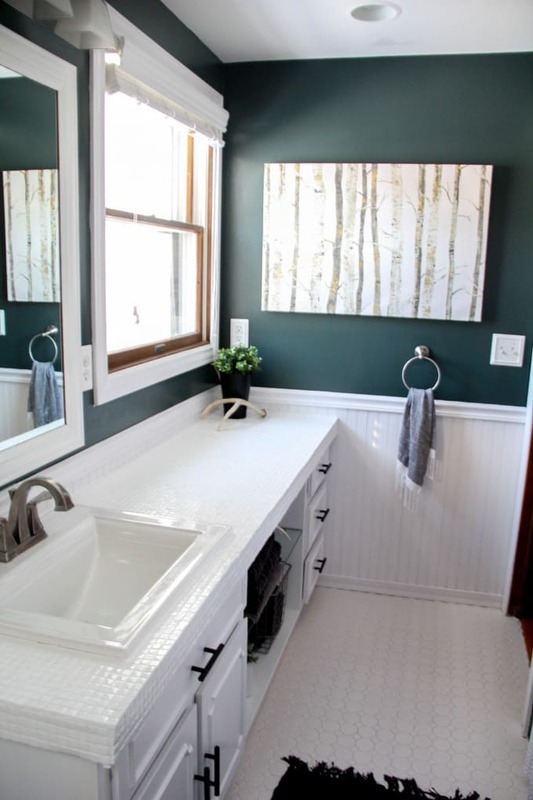 For refinishing a tub, painting my tile backsplash, and for painting a brown countertop. This paint is very runny, and harder to control than typical paint. Normally I don’t tape edges, but I’ve found that it really makes this process easier. I’ve also found that when you combine the two parts of the paint, that really mixing aggressively, and then letting it sit for about 30 minutes seems to thicken the paint to a more manageable consistency. After taping the edges I just use a foam brush to edge. Then I used my foam roller to do about three coats. Along painting the countertops, I also installed new modern drawer pulls. Even though I only needed six, they were cheaper to purchase in a pack of 10. 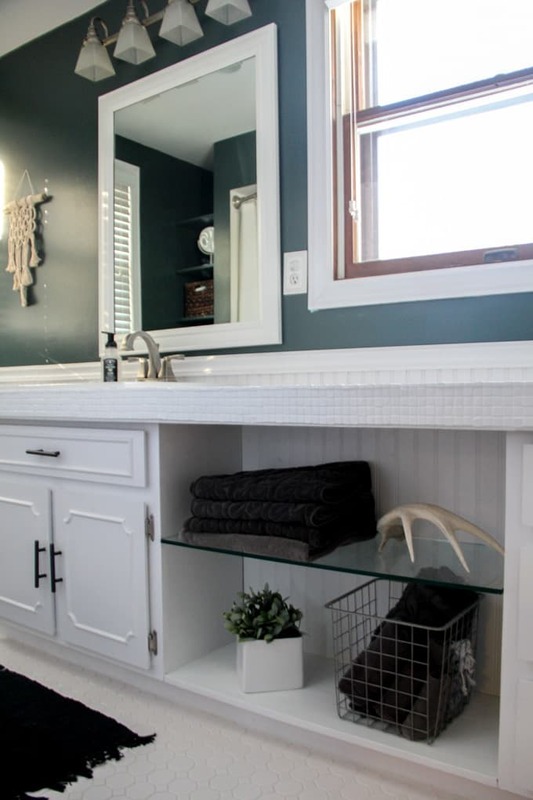 I am so much happier with the modern look that the pulls give this vanity! Along with updating the vanity, I painted the walls and the built in cubbies. 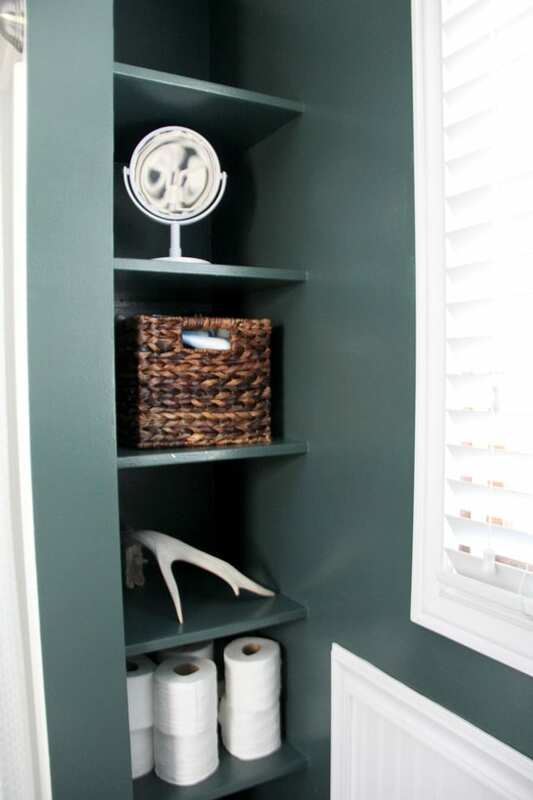 I went with Benjamin Moore “Hidden Falls“, the same color that I used on my Faux Shiplap closet doors and on our reading nook. I also finally got around to painting the mirror white. I just used some leftover Benjamin Moore “Simply White“, my go-to white paint color. Because this paint was leftover, and I purchased the cabinet pulls and mirror over a year ago, the only new cost was the $25 for the tile paint! 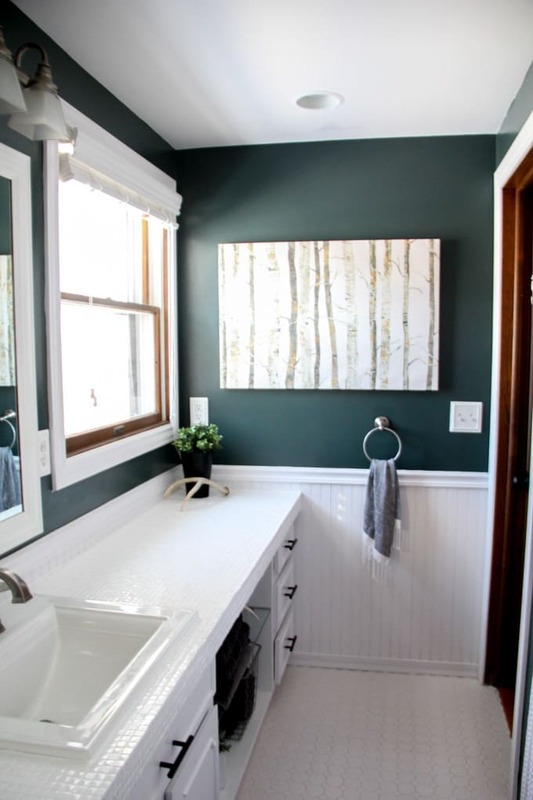 In total though I was able to update this entire bathroom for under $100! This birch tree canvas was originally from my old master bedroom, but I love how it looks against the green walls. Honestly, tile countertops are probably my last choice when it comes to counters. 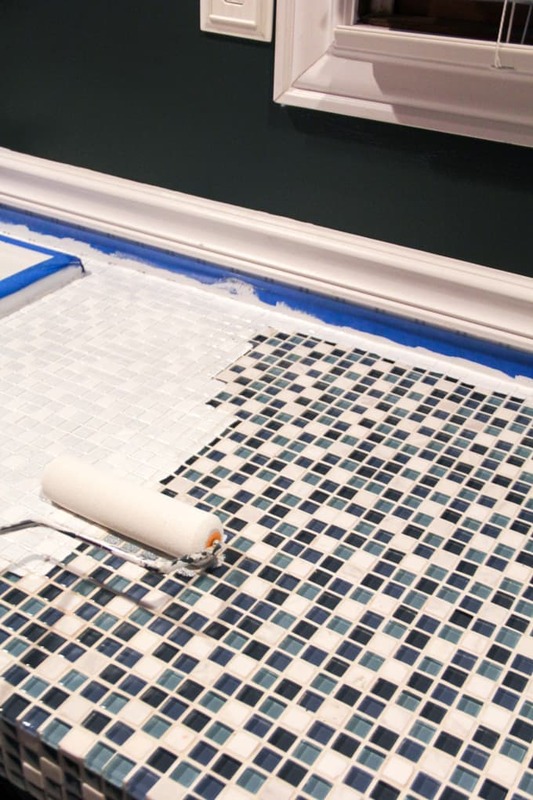 I also would NEVER pick white grout for a kids bathroom floor. But… this was the cheapest and easiest option that I’d be happy enough with. 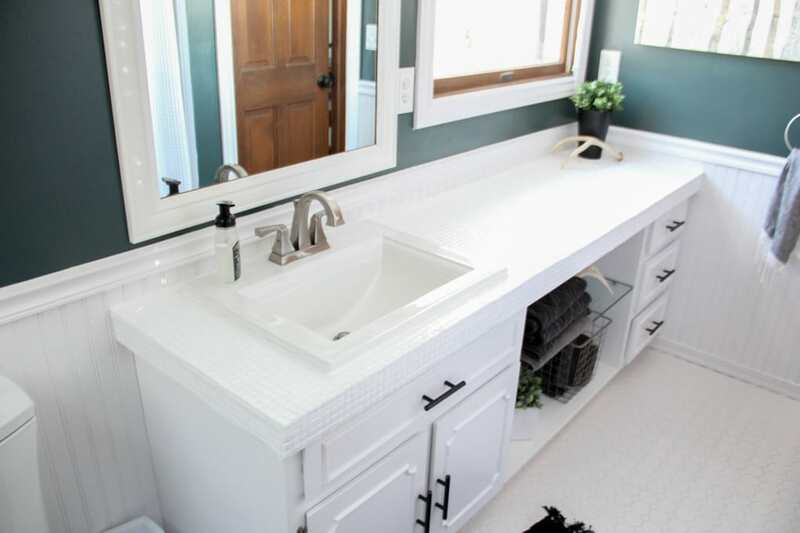 I’d love to someday replace the vanity with a modern one with quartz countertops, and the floor with a darker floor that would hide dirt. For now though I’m happy to have a bathroom that fits my style better. 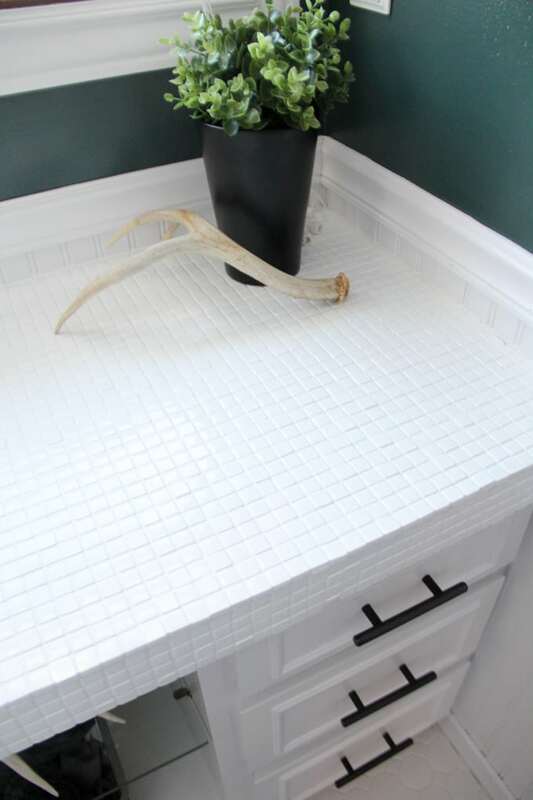 If you’ve got tile countertops with stained grout, or tile that you just really hate, this tutorial for how to paint countertops is definitely for you! 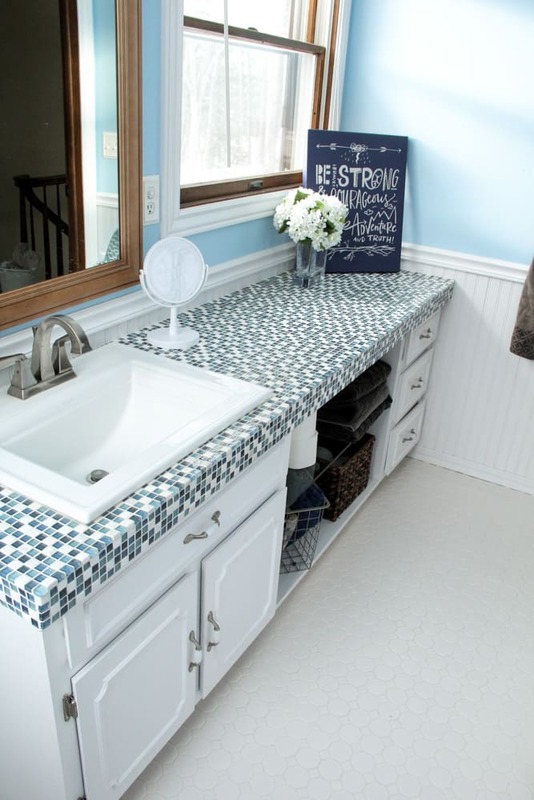 I promise it’s as easy as it looks and you’ll be SO much happier with your countertops! 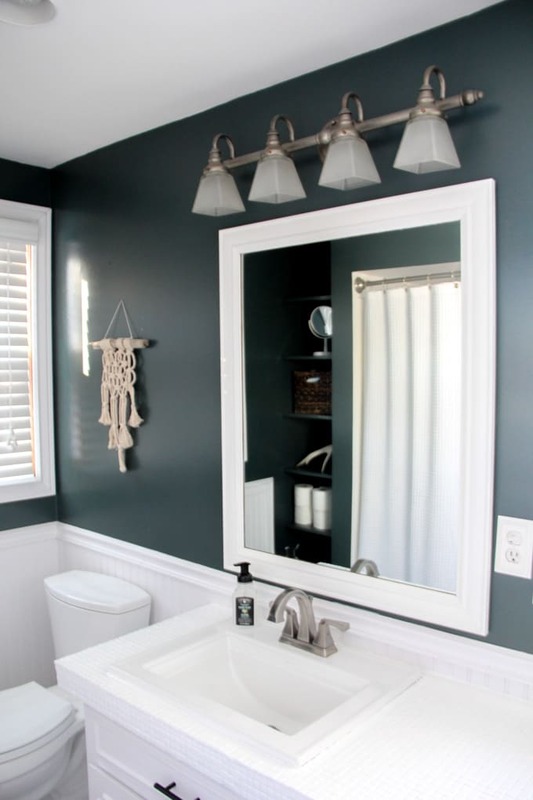 Sometimes a bathroom update really can cost under $100! 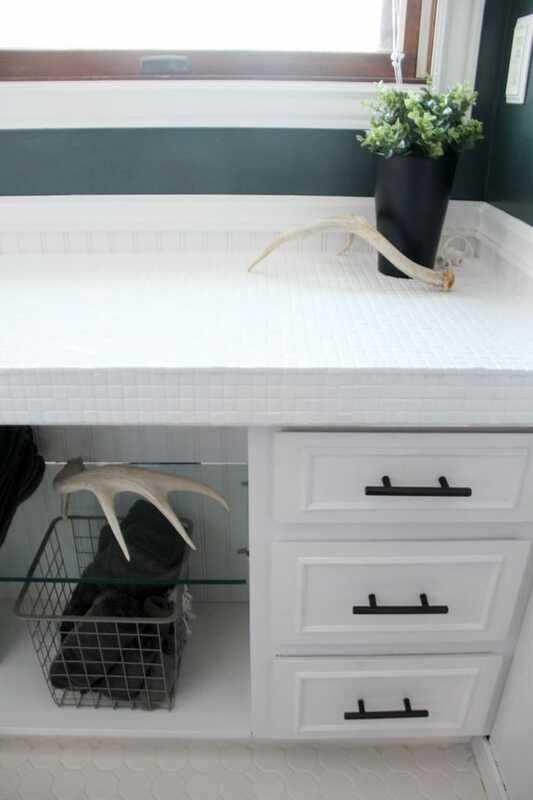 I love what you did to update the counter tops and I’m interested in trying this. Can you tell me if you followed the 4-step process (clean, sand, etc. ), and did you seal it with anything? Thank you! I cleaned them well, but the grout lines still looked dirty after cleaning. I didn’t sand the tile, and I didn’t seal. They held up great and after a year I just had to touch up a few small spots. Hi there! This was so helpful! I plan to do the same with my kitchen counter. How long do you think it will take to settle? I’m worried about not being able to use my counters for a week. Honestly I’d probably give it a good 2-3 days to cure. It’s also VERY smelly for a few days.